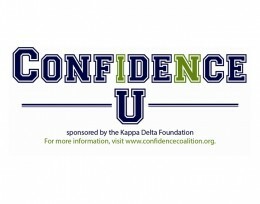 Wright State’s Kappa Delta sorority collaborated with the Women’s Center to promote greater self-confidence in women and girls through the “Confidence U” film project. The statistics are sobering. It is reported that 90 percent of all women want to change at least one aspect of their physical appearance. A total of 81 percent of 10-year-old girls are afraid of being fat. More than half of women are targeted for workplace bullying. And only 2 percent of women think they’re beautiful. But a new movement is sweeping across Wright State University to counter these statistics, one that aims to empower women and build confidence. On Wednesday, Oct. 29, the initiative comes to a crescendo with the premiere of “Confidence U” in the Student Union Rathskeller. The free event begins at 6 p.m. and is open to the public. “The film will make you think about your own confidence — where it comes from, what feeds it and how you can inspire yourself and others,” said Amber Vlasnik, director of the Women’s Center. Vlasnik said the confidence project has been carefully built by a team of students selected by the Women’s Center and Student Activities, the department that oversees all student organizations and Greek life. The two Wright State organizations worked collaboratively to craft careful interview questions and engage a diverse group of women. “We hope ‘Confidence U’ starts conversations among friends and colleagues across campus about confidence and supporting each other in achieving our unique dreams and purpose,” Vlasnik said. The initiative kicked off when Wright State received a $5,000 grant from the Kappa Delta Foundation. Each year, Kappa Delta provides funding to 10 universities across the country to creatively address issues that affect college women. Keucher is one of the organizers for “Confidence U.” Once the women who will be featured in the film were gathered, Keucher sat down with each of them to ask tough and personal questions. Keucher said “Confidence U” will be shared with the Girl Scouts of Western Ohio. It will be packaged with a facilitation guide to aid the troop leaders to discuss confidence with young girl scouts. She hopes discussing confidence with a younger audience will spark an early sense of empowerment and pride in all they accomplish. Attendees at the premiere event for “Confidence U” should look forward to an enlightening experience, says Natasha Wahl, a senior member of Kappa Delta who is featured in the film. For Wahl, confidence has been a driving force in her successes at Wright State. For more information on the premier of “Confidence U,” contact Lauren Ouwerkerk, graduate assistant in the Women’s Center, at (937) 775-4524 or ouwerkerk.2@wright.edu.